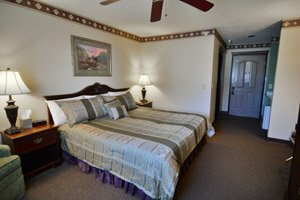 Our King rooms feature quality Thomasville "Queen Anne" style furnishings, HD DirecTV, bedside charging outlets,ceiling fan, and a very pleasing plum-and-sage color scheme. 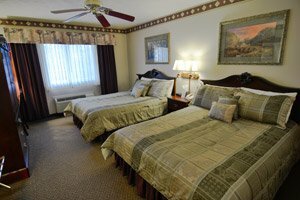 Our Double Queen rooms feature quality Thomasville "Queen Anne" style furnishings, HD DirecTV, bedside charging outlets, ceiling fan, and a very pleasing plum-and-sage color scheme. 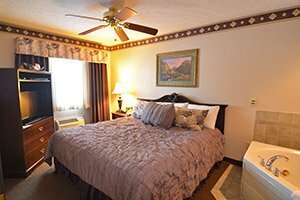 Superbly comfortable, and with great attention to detail, you'll find that our distinctive Hearthstone ambiance and amenities exceed those found at many franchise hotels. Our Deluxe Jacuzzi King Suites provide a wall-mounted big-screen smart-TV, Hi-Definition DirecTV, Blu-Ray/DVD player, electric fireplace, queen sleeper sofa, and kitchenette area. The King bedroom features a smart-TV, HD DirecTV, Blu-Ray/DVD player, and a genuine two-person corner Jacuzzi hot tub.